Above you see a rehearsal performance of “Lucy In The Sky With Diamonds,” sung by Mel Larch with the band, Rubber Soul. This was recorded last Wednesday evening during Mel’s first rehearsal with the band. 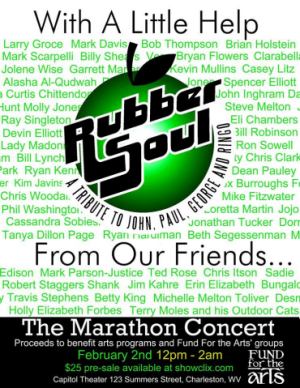 On February 2, 2018, Rubber Soul is staging a marathon concert of over 200 songs that The Beatles recorded. This benefit for Charleston, West Virginia’s Fund For The Arts will require the assistance of dozens of guest performers during the twelve-to-fourteen hour show. That’s why the concert is called, “With A Little Help From Our Friends.” Due to the sheer number of songs being performed, most guests will only get one rehearsal with the band. This video shows Mel’s first performance of the song with Rubber Soul. This video was recorded with one camera and ambient microphone and nobody mixing sound, but it still gives a hint of how special this concert will be. Advance tickets for the event can be purchased from Showclix. If my rapidly failing computer cooperates, later tonight you will see a few more videos from that night. One more of Mel, plus Casey Litz of The Company Stores and Erin Martin. Keep your fingers crossed that the PC keeps working. This clip was rendered in standard definition, just to reduce strain on the old girl.